Will automation raise anxiety on the workforce? McKinsey estimates that between 400 and 800 million individuals could be displaced by automation and would need to find new jobs by 2030. Although automation will pose a threat to employment and eliminate jobs, it is important to also consider the new opportunities it can bring and how it can transform the structure of work and future jobs. 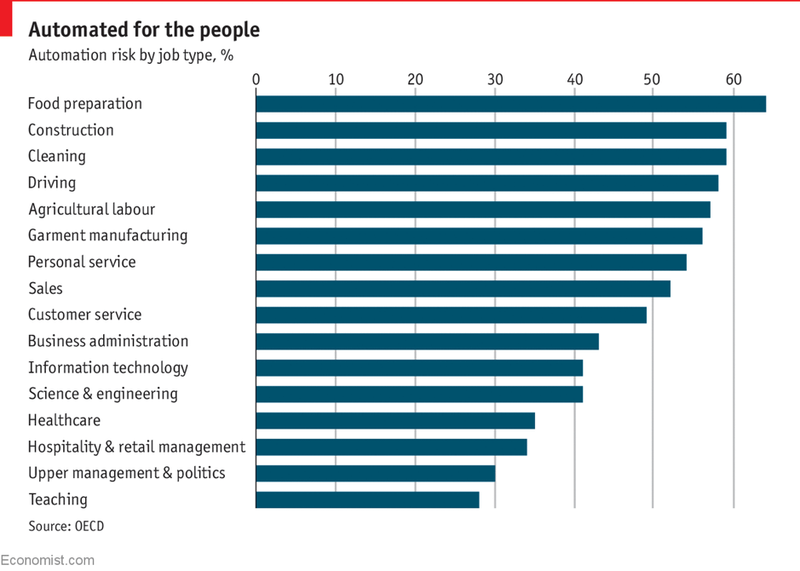 Jobs that are at high risk of being automated includes the manufacturing and agriculture industry. This is no surprise as humans have been displaced by robots in manufacturing plants for many years now. Other sectors that are at high automation risk would be transport and logistics. Large corporations such as Amazon and UPS are looking into drone delivery services which may be faster and cheaper than existing logistic methods. Robots and AI have been created by humans and they require humans to operate. Humans need to be in control in order for technology to provide what it is programmed to do. Technology can facilitate and reduce monotonous tasks but they are unable to generate creativity and critical thinking.